The prize presentation ceremony for the second Sustainable Development Promotion Award for Students of Higher Education Institutions (SDPA) was held today (March 15) to commend students for their efforts in promoting the concept of sustainable development and spreading the message to the community. Launched by the Council for Sustainable Development (SDC) in 2016, the SDPA aims to raise awareness of sustainable development among youngsters and encourage them to engage in sustainable practices in their daily lives, and to help spread the messages to their peers, families and the community. The competition consisted of two phases: the Proposal Phase and the Implementation Phase. The five best proposals in the first phase were given the Proposal Award. Those proposals that were successfully implemented in the second phase were presented the Implementation Award, while the best overall performer received the Outstanding Project Award. Officiating at the ceremony, the Chairman of the SDC, Professor Arthur Li, said in his welcoming remarks that he was impressed with the high standard of the entries, which proved that the SDPA could inspire wisdom, passion, creativity and commitment among university students, adding that he was glad to see young people supporting sustainable development in Hong Kong in word and deed. The SDPA comes under the purview of the Education and Publicity Sub-committee of the SDC. In presenting the awards, the Chairman of the Sub-committee, Dr Ng Cho-nam, and member, Professor Leung Wing-mo, also shared their views on the projects. Speaking at the ceremony, the Deputy Secretary for the Environment, Ms Irene Young, said she hoped that the SDPA could bring together talents to further promote sustainable development in Hong Kong. At today's prize presentation ceremony, the awardees briefly presented their projects and shared with SDC members and other participants their ideas and experience in running the projects. The Outstanding Project Award went to "Criss Cross Country Parks" (University of Hong Kong). 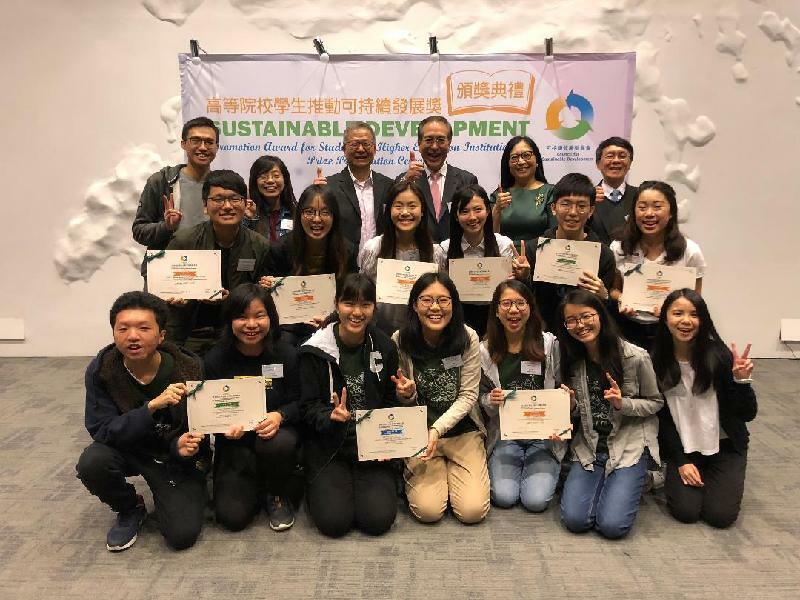 Other award-winning proposals included "Bannew - Brand New Solution to Banners" (Chinese University of Hong Kong), "Venture Hong Kong" (Chinese University of Hong Kong), "Greentitude Festival" (University of Hong Kong), and "WasteChange HK" (Hong Kong Baptist University). A list of awardees and information about their projects are available on the Environment Bureau website (www.enb.gov.hk/en/susdev/public/sdpa.htm).